Fourteen days in Oregon: rolling golden hills of the Columbia Plateau, miles of winding two lane highway, dark basalt cliffs and rimrock, a Forest Service ranger station in a small town. Driving dusty roads to lookout spots and dodging cows, taking weather observations every hour, walking into a fire to watch the burning. The whirling shimmer of mountain bluebirds flying up in front of the truck, flocking but not ready to head south quite yet. The sun on their wings. Coming back at dusk, eating dinner at bedtime then falling dead asleep till the next morning’s alarm. Wearing green Nomex pants, lacing my fire boots. Day after day. Some days hot and windy, other days threatening thunder and lightning. Stopping for fresh water at a campground every morning–sweet fresh spring water. Lightning. Rain. Flat tires. Long conversations, occasional goofiness. For me, feeling the friction between wilderness and humanity. Or at least my perception of friction. And then, fourteen days are up. Yesterday was a travel day and I crossed the Columbia River back into Washington. Drove the rest of the way home this morning, fearful of falling asleep at the wheel. Finally, the traveling came to an end and I came to ground here at my house. 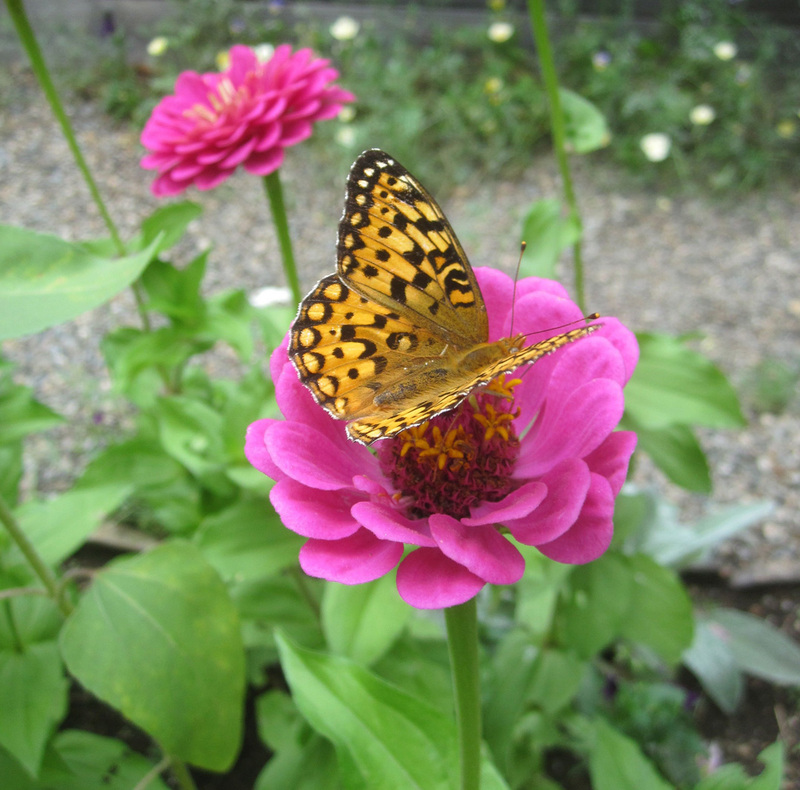 It was a gentle touching down, as soft as a fritillary landing on a zinnia in the garden. The sweetness of home: Flowers. Green beans that need picking, tomatoes, pears. Three brown eggs in the nest box in the coop–the pullets are laying. Sweet peas have climbed to the top of their trellis and are falling back down, still covered with fragrant pink, white, and lavender blossoms. There is a quiet place to take a nap with a quilt pulled over my head. It’s time to rest, at least for a day. In the woods, squirrel and nutcrackers are busily preparing their food caches, and it’s time for me to do the same. Just in time for the Big Rain…guess I won’t have to water tomorrow! Enjoy the gifts of the garden, and from your Feathered Grrls.